The Agusta plants were founded in 1907. At that time, the Italian constructor Giovanni Agusta founded a company manufacturing aircraft of its own design. The Great World War caused the company's business to cease. The resumption of production took place in 1923. The company then adopted a new name Costruzioni Aeronautiche Agusta S.p.a. The factory plant was located in Samarate in Lombardy in the north of Italy. The company's largest task was a four-engine Agusta A8 aircraft, designed, among others, for transporting 26 passengers. The plane made its first flight on June 9, 1958. Its design resembles the Douglas DC-4 aircraft. The factory hasn’t received any orders for this aircraft. However, already in 1952, Agusta purchased the Bell 47 helicopter license. This decision influenced the change of the production profile. The cooperation of the Agusta and Bell companies in many studies and programs is conducted to the present. Agusta helicopters are traditionally marked with the letter "A" and a three-digit number. The first one was the A.101 helicopter, which can take 35 passengers on board. The Agusta company also dealt with the production of turbine engines for its products. In 1961, Agusta purchased a license for another Bella product, the Bell UH-1 Huey helicopter. In 1967, a license was purchased for the production of Sikorsky SH-3 Sea King helicopters, produced in several versions. Also in 1967, a Boeing CH-47 license was purchased. In 1971 Agusta built the most recognizable own helicopter designated A.109. In 1983 the factory made the first flight of the first attack helicopter marked Agusta A.129 Mangusta. In 1983, Agusta took over the Italian aircraft manufacturer SIAI-Marchetti. From the beginning of the 80-year period Augusta's cooperation with the British company Westland Helicopters. The first joint project was the AgustaWestland AW.101 helicopter, which replaced the Sea King helicopter. Cooperation was also undertaken with other companies in Western Europe. In 1992, all these companies established a consortium of the NHIndustries, in which Agusta had its shares. The effect of work was NH1 NH90 helicopter. In 1998, the company together with Bell Helicopter Textron established a joint venture known as Bell / Agusta Aerospace Company. The product of this cooperation is a vertical take off and landing plane (VTOL), Bell / Agusta BA609, predecessor V-22. In 2001, Agusta and British Westland Helicopters merged and a new AgustaWestland company was established, which has about 20% of the global helicopter market. To date, about 20 types of helicopters have been created to perform various tasks. WSK PZL Świdnik seeking orders to avoid liquidation of the plant, in 1996 concluded a contract with Agusta for production of structural elements of Agusta A.109 helicopters in Świdnik (currently AgustaWestland AW.109). In Świdnik, the production of helicopter hulls and tailpieces began. In 2006, a five hundred hull A.109 was delivered from Świdnik. In 2001, the cooperation was extended to the hull production for the Agusta A.119 Koala (currently AgustaWestland AW.119). Świdnik had a large share in the design and production of AgustaWestland AW.139. Since 2012, complete hulls for the AW.139 model have been created in Świdnik. The AW.149 helicopter is one of the most modern helicopters in the world. According to information from May 2015, the company planned to build 350 copies over the next 20 years, which may generate revenues for PZL Świdnik in the amount of over PLN 50 billion. In Poland, in the atmosphere of scandal, the EC725 Caracal helicopter of the Airbus Helicopters group was selected. Fortunately, the choice was annulled because the new Government of the Republic assessed that Airbus is not able to offer a basic offset. Further talks were pointless. In this situation, the topic of obtaining new helicopters for the Polish Army has returned. In such a situation (2018), the companies that produce helicopters in Poland, namely Świdnik and Mielec, have a chance. 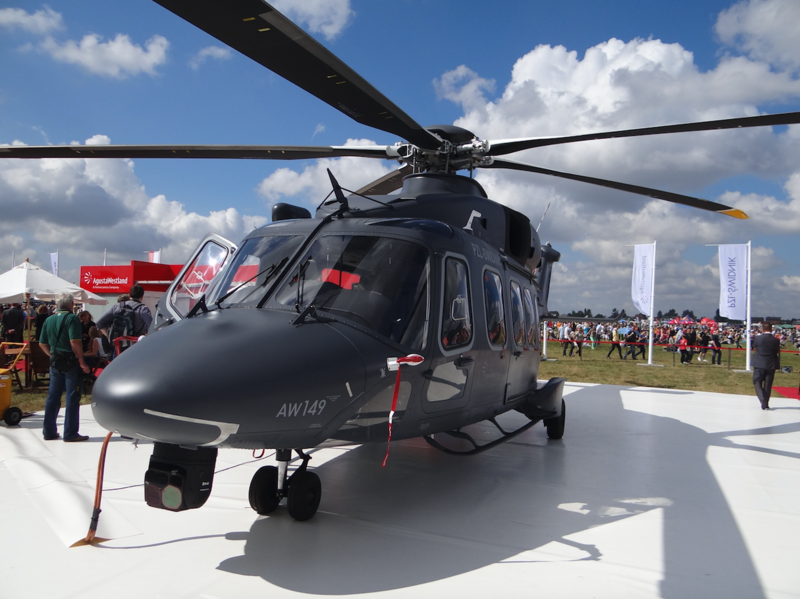 The AW.149 helicopter was already demonstrated several times in Poland, on the occasion of various exhibitions and shows. In May 2015, it was demonstrated in Warsaw at the Bemowo Airport on the ground and in flight. Previously, the shows took place in Świdnik. The president of PZL Świdnik, Mr. Krzysztof Krystowski personally was involved in the promotion of a new helicopter, which is not yet produced in Świdnik. 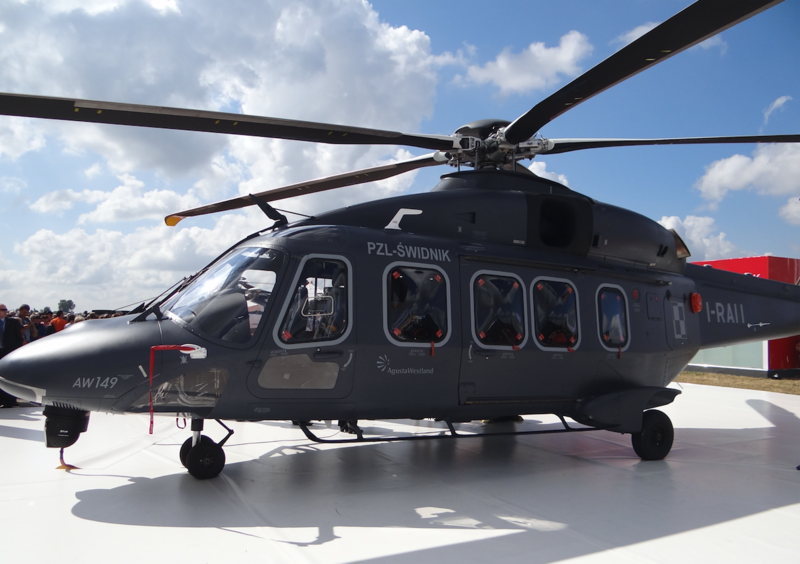 The Polish Army was and is interested in three helicopters of the AgustaWestland / Leonardo Helicopters group. One of them is larger AW.101, the second is smaller AW.149, and the third one is W-3PL Gluszec. The first flight of the helicopter AW.149 was made on November 13, 2009. AgustaWestland AW.149 is a multipurpose helicopter manufactured by the Leonardo company (formerly AgustaWestland), intended for carrying out transport tasks, battlefield support, combat and sea rescue and command machinery. The helicopter is an enlarged version of the AgustaWestland AW.139 helicopter. The AW.149 helicopter was created as a response to an order placed by Italian forces for a new rescue helicopter. So far, AgustaWestland offered light machines AW.109 LUH and heavy AW.101. Between them was an average helicopter AW.139M. In the assumption AW.149 was to be of similar combat capabilities as NHI NH90, but much cheaper in operation. The first official information about the launch of the AW.149 program appeared in 2006. In July 2014, the helicopter received an Italian certificate. Leonardo estimates that the AW.149 helicopter will serve future users for a minimum of 40 years. It was designed to meet the modern challenges posed by the requirements related to the operation of military contingents abroad and the protection of national security, while providing a unique tactical advantage. The helicopter has low noise and vibration levels. Modern avionics enables operation in all weather conditions, both during the day and at night. Glass cockpit with four multifunction screens is fully compatible with NVG goggles. The integrated digital avionics system works with mission equipment and a 4-axis dual autopilot. Advanced systems for monitoring and displaying the status of the helicopter and communication with the crew provide high situational awareness. Oversight Obstacle Warning System (OWS), dangerous ground above TAWS (Terrain Avoidance and Warning System), collision course with another TCAS (Traffic Collision Avoidance System) aircraft increases safety while reducing crew load. The transport cabin and cockpit are fully resistant to shattering and overshoot. Armored crew seats and seats in the transport cabin absorb energy when landing hard. Critical helicopter elements are duplicated. The rotor of the rotor can operate without oil for 50 minutes. AW.149 is a helicopter with a take-off mass of 8,600 kg, with the possibility of taking an external load of 2,800 kg. The helicopter can fly at a maximum cruising speed of 278 km / h and can perform tasks, with 12 armed soldiers on board, in a radius of around 280 km (150 Mm). Model AW.149 took part in a competition for a helicopter for Turkey, in which it lost to the helicopter S-70i Black Hawk, which ordered 109 pieces in 2014. PZL Świdnik issued AW.149 in a tender for a multipurpose helicopter (based on a common platform) for Land Forces, Navy and Air Forces of the Republic of Poland in an infamous bid for the Polish Army in 2012. The first helicopter demonstration in Poland took place in Dęblin. In 2013, the AW.149 helicopter was presented at the Air Show in Radom. In 2013 and in 2016, PZL Świdnik showed the AW.149 helicopter at the MSPO in Kielce. Helicopter AW.149, which can be easily reconfigured to perform various tasks: transport, medical evacuation (MEDEVAC), search and rescue - including combat (SAR and Combat SAR), special operations, reconnaissance and close support from the air. In Kielce, the machine received additional weapons, including guided ones. PZL Świdnik is one of the weapon variants presented by laser-guided missiles offered by Thales. As a potential option, a tank with CIRIT rockets of similar purpose is demonstrated. In addition, the machine can also carry trays with small arms.